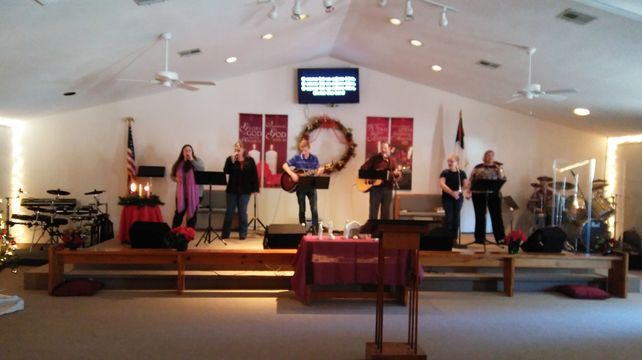 Our Praise and Worship Team is ever evolving to meet the current needs of our congregation. It is headed up by our resident volunteer, Aubry Harden. Our group members are a diverse bunch. Week to week you will usually see Aubry, Pastor Harden, and a few others who will share music meant to touch hearts. From time to time other church folks, former praise team people etc. will bring special music, or a special day of worship. We have 3 song writers among us, so you might have opportunity to be blessed by an original composition inspired right from the desk of God. The Lord is blessing this part of our church as we are accepting His leadership and guidance. Guitars, voices and some accompaniment are our main instruments we use. Simple is sometimes better as our Lord showed so often. Questions, concerns or comments about our Music program can be sent via our contact page .